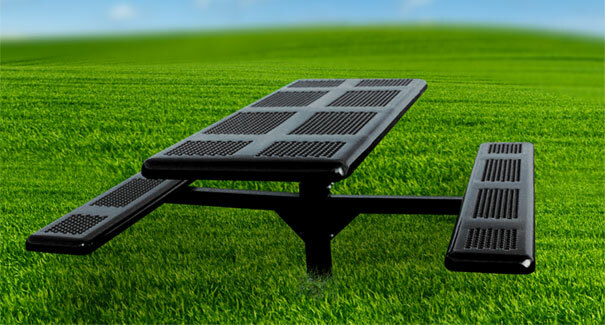 Perforated metal tops and seats on a 4" x 4" square powder-coated pedestal frame make these twin seated rectangular outdoor tables the most durable and strongest on the market. ADA table has one 24" overhanging side for universal access. Edges are rounded for safety. 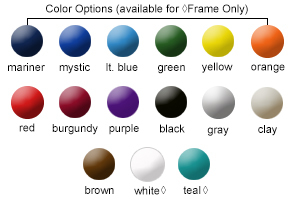 Tops and Seats are coated with a lightly textured Polyethylene finish in any of the color options shown below. To safeguard against potential vandalism of ADA models, an optional Anti-Vandalism bar for Universal Access overhangs is available to order. # 11 Gauge Perforated Metal.